She takes note that it is the "Year of the Tree". So they decorated the gazebo top to look like... a tree house? 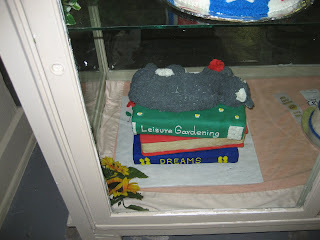 In the Home & Arts building, she finds a cake that looks like it was made just for her. This is for someone's retirement. When there is a brief rain shower, she directs everyone with her to seek shelter in the HortAg Building. No one will want to go out into the rain, so they won't realize how much time she spends looking at all the vegetables and flowers. She sees all these tomatoes but is disappointed that there is no "ugliest tomato" category. It's just as well, she would have won. She's proud to see a banner for her alma mater. 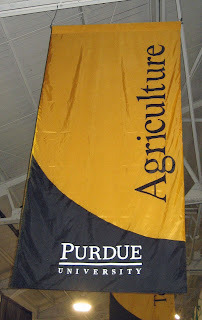 Yes, really, the Purdue University School of Agriculture. Boiler up! Eventually, she leaves the plants behind and goes to see the chickens. Doesn't every gardener want a couple of chickens in their backyard, especially fancy ones like these? Well, at least Robin(Bumblebee) is getting some chickens. She tries to talk to the rabbits, but they are having nothing to do with her. Have the rabbits read about May Dreams Gardens? In the cow barn, she eyes the beginnings of a beautiful garden. It's a cow pie! 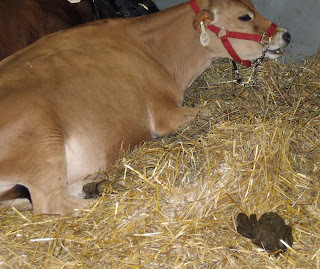 Did that cow just say, "Moo, this poo's for you?" I hope you get a chance to go to your state fair. 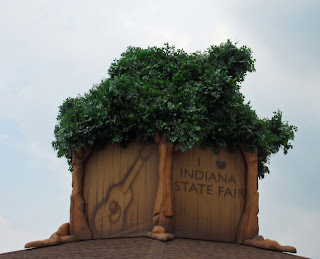 The Indiana State Fair continues until Sunday, August 17th. Go if you get the chance. Robin of Robin's Nesting Place finally went, check out her beautiful pictures! 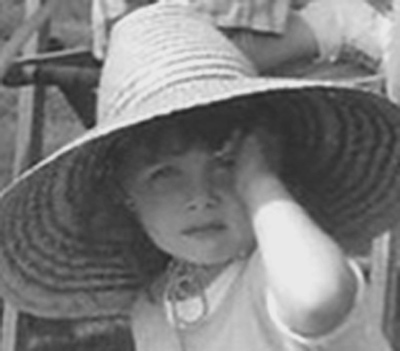 Have you been reading children's books recently? "If You Give a Pig a Pancake"
What is that thing on the top of that cake? A cat? A half-knitted sweater? I think the rabbits had heard about you & your Mr. McGregor imitation (chasing them while waving a hoe). Please tell me you didn't ask for any free manure to take home. I really do want chickens but now it's too late. You can't leave home and have chickens or the foxes will get them. Anyway if I did, have them that is, I would have chickens that laid brown eggs. I only ever buy the brown ones as they look so much more wholesome. There were some beautiful tomatoes there. 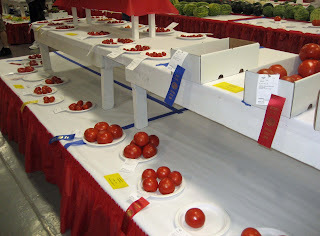 I'd have rather had a tomato sandwich than any of the other fair food. 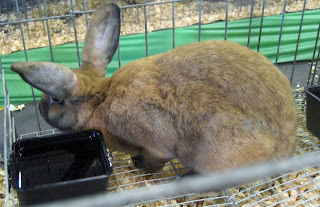 I was so thankful for the rain today but I did think about those who were attending the fair. Glad it worked out in your favor. The Dung Beetles will be so impressed. They dig that kind of thing as cow dung. I liked your comments and pics. I like to see the home baked goods too. Did they have quilts and other such things? I do want some chickens but can't have them till I get a farm house. When I do get that house, I want some fancy chickens like those posted. They are so handsome. Ahhh! You visited the chickens! Aren't they beautiful?!?!? Doesn't it make you want to find a way to have some of your very own chickens? Mine should arrive today. I hope. I hope. 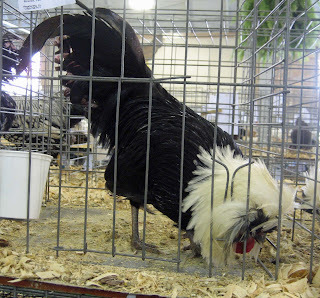 The silky chickens were a favorite sight at county fairs in IL and Wisconsin. We've never been to a State Fair, but I sure liked both of the movies: "It's A Grand Night for Singing", "It Might as Well Be Spring", "Our State Fair is a Great State Fair". Retirement means cats sleeping on a stack of garden books? Huh? Thanks for taking me to your fair in Indiana, Carol! The Indiana state fair is always a blast, thanks for taking us along! I actually got to ride my horse at the state fair in 4-H...I didn't win but it was great fun! 2Greenthumbsup, I haven't read those books but I think I've heard of them. My niece, the elementary school teacher, might have copies. Mr. McGregor's Daughter, That is a cat on top of that stack of books. On the manure, they must have a BIG pile of that somewhere, with all the animals at the fair. I wonder if they will have some for free later on? 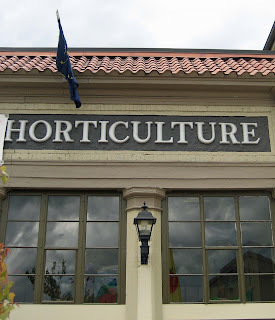 Perennial Gardener, That is odd you have been to state fairs, but not in your own state. You should go! Lancashire Rose, Chickens would be cool to have, but we have a HOA and coventants so we aren't allowed to have them here. Robin's Nesting Place, Yes, those were very good looking tomatoes. Are you growing any of your own yet? Anna, They did have quilts and all kinds of "needlecrafts" but I wasn't as interested in them as I was in the veggies and flowers! 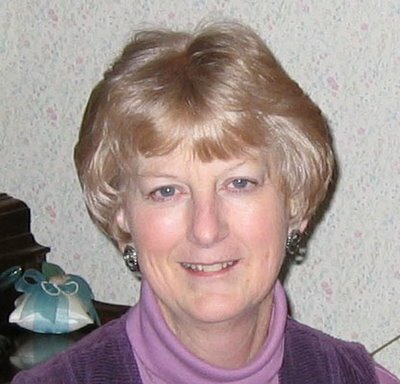 Robin Wedewer, Yes, I visited the chickens and I don't mind telling you I had to do a little backtracking and take an extra ride on the fair train for 75 cents to get back to them. I knew if I didn't get some pictures of the chickens, I'd hear some clucking! Annie in Austin, There are no cat plans in my retirement, I mostly liked the title of the book. The state fair is fun. I hadn't been for several years, which made it that much more enjoyable this trip. Plus I was with my sister and her kids and some of their friends, which made it fun, too. Lisa, Cool, so I take it you've been to the fair a few times? Thanks all for the fun comments! Carol, your state fair sounds like fun. I had a good chuckle at what the cow said to you :) Apparently cows like you better than rabbits do if they're willing to share their poo! We have some very large piles of very old 'poo' up behind our barn. That thar is pure black gold - hot diggity dog!